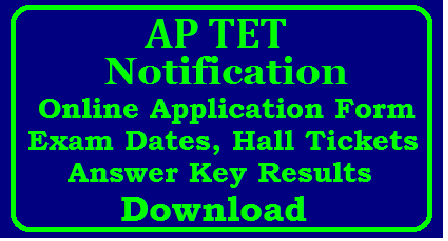 AP TET 2018/APTET 2018 Notification announced on the official website of Andhra Pradesh TET which is www.aptet.cgg.gov.in, you can now apply for AP TET 2018. APTET Latest News: The candidates at the time of applying for APTET 2018 should be in possession of the minimum qualifications prescribed for a teacher for I to V classes (Paper-I) and VI to VIII classes (Paper-II) as given in Official Information Bulletin. AP TET Notification 2018: The candidates who are pursuing final year of any of the Teacher Education Courses recognized by the NCTE or the RCI, as the case may be, and / or the Language Pandit Training Courses, during the academic year 2012-2013 can also appear for the APTET Exam 2018. The candidates at the time of applying for AP-TET 2018 should be in possession of the minimum qualifications prescribed for a teacher for I to V classes (Paper-I) and VI to VIII classes (Paper-II) as given in Information Bulletin. The candidates who are pursuing final year of any of the Teacher Education Courses recognized by the NCTE or the RCI, as the case may be, and / or the Language Pandit Training Courses can also appear for the AP TET-2018. All candidates have to pay Rs. 250/- for the application form. I am an BBA graduate with B.ed in English. In notification I see that BA, BCom, BSc can apply. Am I eligible to write TET & DSC ? Please help me in giving me right info.